I`m on my Christmas break from work and I left the house around three o'clock to drive out east towards Conrich to see what there was to look at. 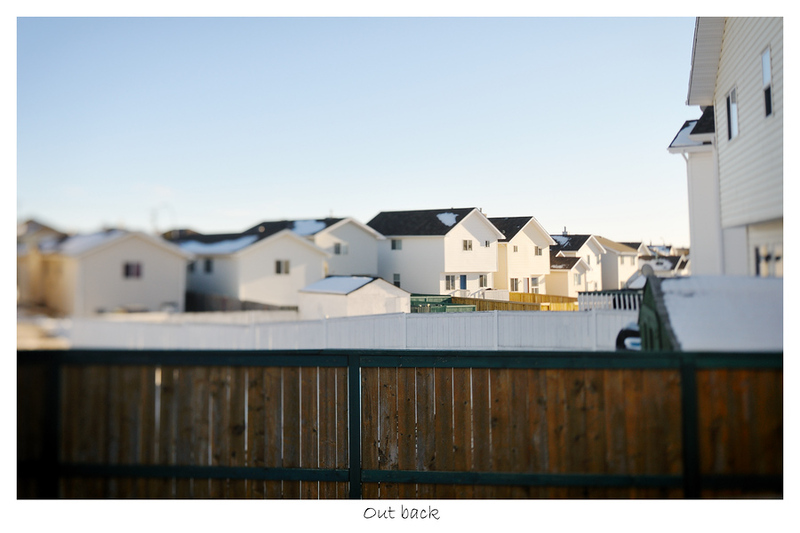 It was cold today at -20c. 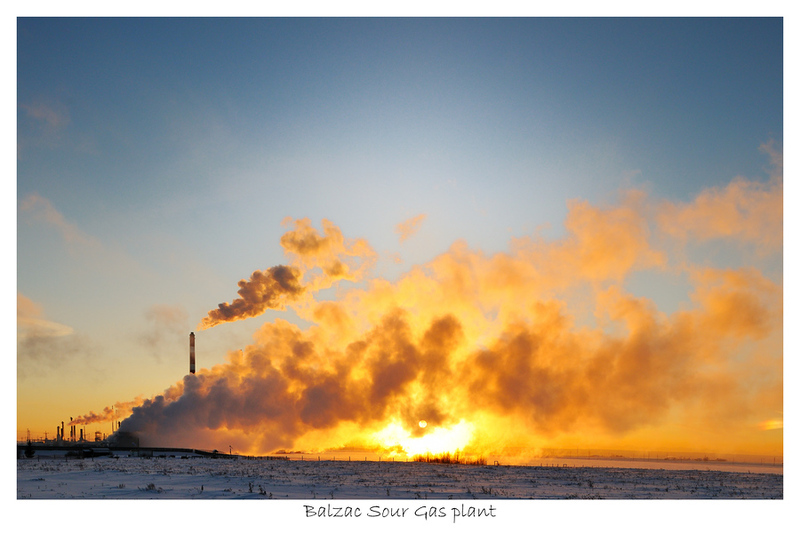 To the north I saw large plumes of moisture coming from the Enmax energy plant and the Balzac sour gas plant. I thought it'd be neat to get behind the clouds and try to shoot some pictures. Today, after seeing the plumes I decided that I wanted to get behind the plants and see what it would looked like. I made my way along some country roads stopping a couple of times to investigate some interesting trees near a barbed wire fence and later I spent some time looking at some snow banks along the side of the road. After a bit of a round about drive I did eventually end up behind the plant. Lucky for me the sun was pretty low. Afterwards, when confirming the location, I found out that their going to disassemble the plant in 2011 - mostly because it`s old, and there isn`t enough production coming out of it to justify the cost of the required upgrades. From what I`ve read, it`s been there for 50 years. Was driving home from work and the parking lot lights at the train station were looking kind of interesting. I've been looking at the area for a while now and think I could get some interesting photos here. Today I stopped to see what it looked like from the pedestrian overpass. A couple of months ago I drove by and thought I could get up on the bridge but it was still under construction. The car temp sensor said -17deg Celsius, which isn`t too bad, right ? So I parked the car near the ramp, grabbed my camera and tripod and ran up to the top of the bridge. I snapped a shot directly over the tracks but that wasn't doing it for me. It seemed colder than -17, especially on my exposed skin. I moved over to the center of the bridge and composed the shot as shown above. 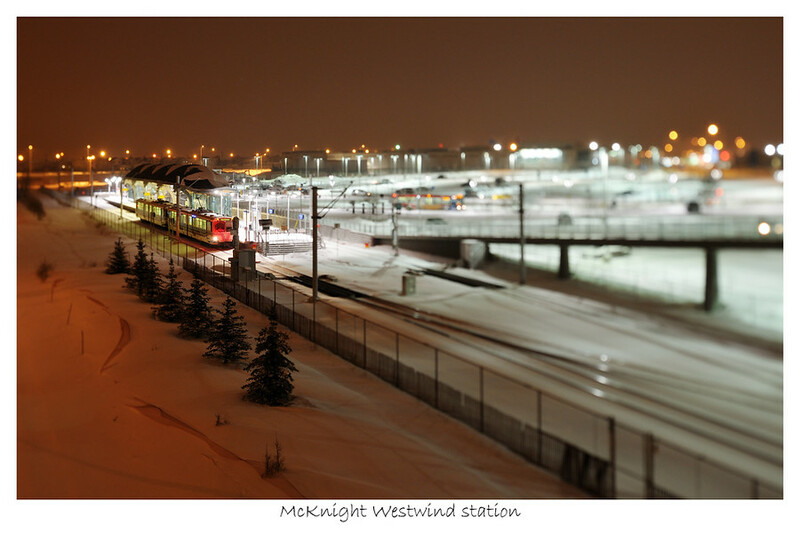 Using the PC-E, I was able to tilt the focal plane so that the focus was on the train. I like how the other parts of the image are blurred and how all the lights become little circles. While I was taking the pic, my fingers started to get cold. then after a few minutes of fiddling with the focus and what not, my fingers got colder. Soon, I couldn't feel them anymore. I ran back to my car, fished my keys out of my pocket and threw the tripod and the camera inside and tried to warm up my fingertips. I couldn't believe how cold they were, they were almost frozen solid. Back when I was in university, I walked crossed a largish field in the wintertime without a toque in order to get to the mall. I actually froze my earlobes into ice cubes. When my earlobes thawed, it hurt like h*ll for quite a while. My finger tips were all starting to hurt like that, not quite so bad, but it certainly isn't pleasant. I was surprised at how quickly they went from normal fingers to fingers that stopped working completely. Even now, as I type this, some of them are a little bit tender. Anyway, I hope you like the pic. I still have some ideas for this location and I hope to be back sometime.. maybe when it's warmer. Drove into work to tweak the budget. On the way in had my camera on my lap hoping for something interesting. I was near the Bow on Center street and took a few shots of the disposal truck as it was sitting there while I waiting for a red light. I liked how this one turned out and thought I`d share it with you. I was stuck in the house all day and had stepped out on to the deck to taking some recycling out to the bin. I saw this view and wanted to make a picture of it. I figured I'd use my 24 PC-E lens and wanted to twist the focal plane a bit. I took a few shots and this is the one that I like. It's the view outside the backyard, looking kind of south east. My fence is in the foreground, and the houses are all colored similarly. I liked the pattern that it made on this cool winter day. One day there will be trees breaking up the horizon - just not yet. Afterwards, I looked too closely at my camera sensor and noticed all kinds of dust on it and spent the greater part of two hours trying to clean the sensor with some swabs that I'd bought a couple of years ago. It wasn't an easy feat, but I think I finally got it.